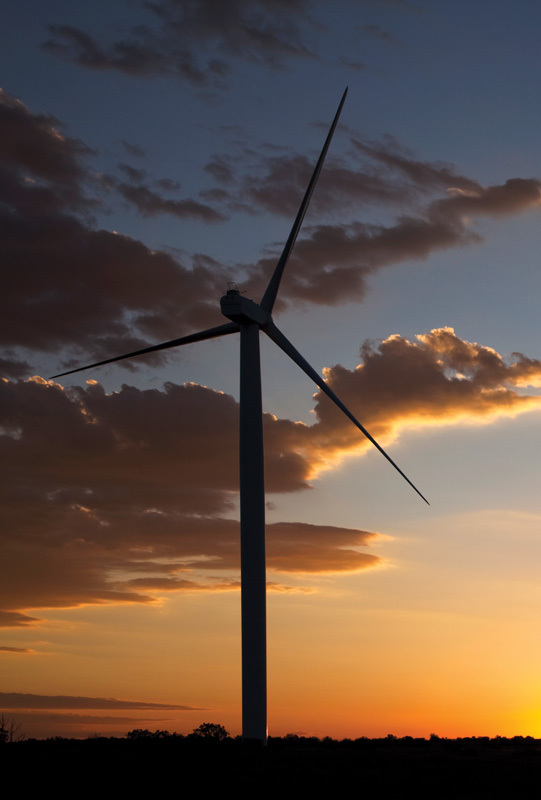 The State of Arizona is a major player in renewable energy—with an understandable focus on solar power—but Arizona now has its first commercial wind power project,Iberdrola's 128 MW Dry Lake project. The State of Arizona is top of mind when it comes to selecting locations for renewable energy facilities—but that usually means solar power, rather than wind power. But Iberdrola Renewables recently completed the first wind power project in the Grand Canyon state, the 128 MW, multi-phase Dry Lake project. 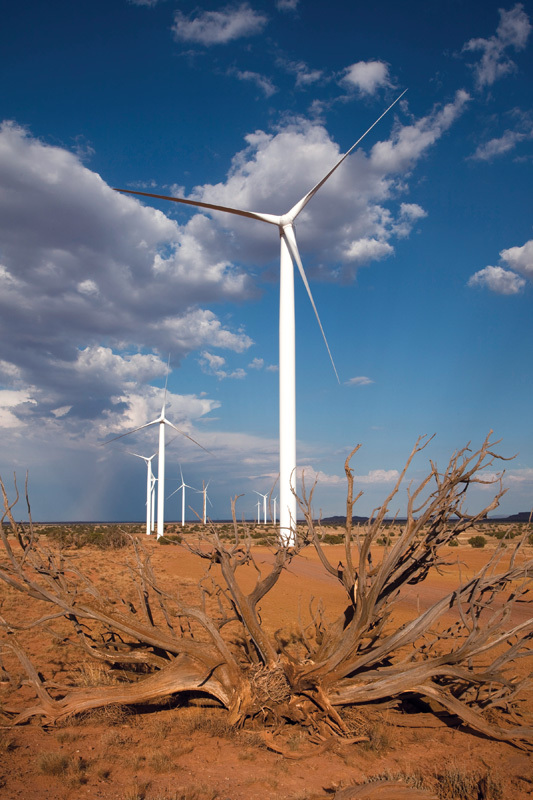 What made the economics of a relatively low wind resource project work in Arizona was a combination of an uncomplicated wind power construction project, along with attractive power rates from one of the state's largest utilities, SRP. SRP is purchasing all of the wind power from both phases of the Dry Lake project. Dry Lake has been a work in progress for a while. "In the early 2000s, we were looking at opportunities in Arizona though we understood, historically, it had not been known as a windy place," said Jesse Gronner, project developer for Iberdrola Renewables. "But we still thought it was something that we could make work. "We had been prospecting for good wind sites, and we did have a few prospects in different parts of the state," he explained. "We came to the conclusion that others had—that there is not an extremely robust wind resource in Arizona, but there are some areas where there is a developable wind resource." 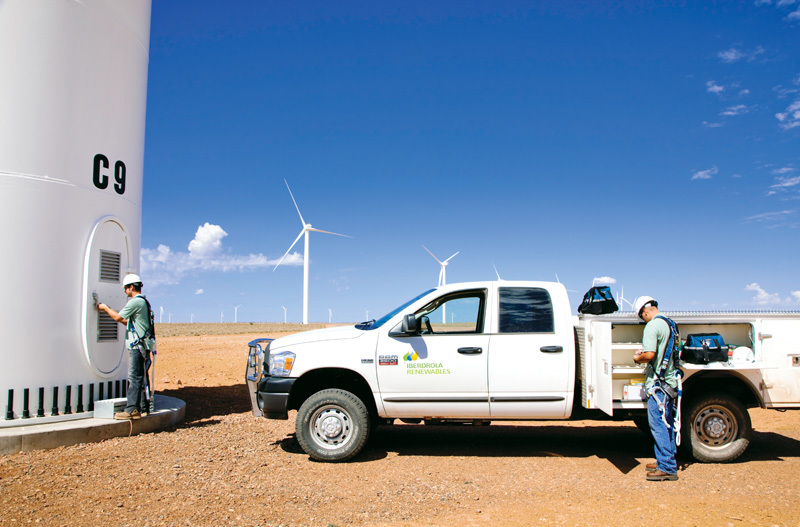 Iberdrola Renewables completed the first phase of the state's first commercial scale wind project—Dry Land Wind Power—in September 2009, and it was followed shortly after with phase two. The first phase employed 30 Suzlon S88 2.1 MW turbines, while phase two, which was completed earlier this year, has 31 of the same Suzlon turbines, for a combined nameplate capacity of 65 MW. Phase two is about three miles east of phase one, and there could be more to come in the future. Full development of the site could result in a total of 239 turbines at Dry Lake, according to the federal Bureau of Land Management. The first phase of Dry Lake was built on a mix of federal, state, and private lands. The project required the approval of the Bureau of Land Management and the Arizona State Trust Lands. Authorization of the project followed a year-long review that included numerous environmental studies and much inter-agency coordination. For Iberdrola, the initial work, planning, and construction for the project took about five years. Perhaps more so than wind-rich projects, they had to make doubly-sure the numbers would work on Dry Lake. "The wind resource is quite a bit less than what is typically determined as a needed capacity factor to make a wind project work," says Gronner. "It was among the lowest resources in our portfolio of development assets, but power prices in the area were very strong, and we thought it was something that we could put together and make it work." Exactly how do you counter a low wind resource on a project? Good power prices can go a long way, says Gronner. "But you need certain other things," he added. "One is relatively low construction costs—you want to have a site that is topographically simple so it will be generally easy to build a wind power project. And you want to be able to minimize the transmission and interconnection costs." They were able to utilize generally smaller—69 kV—voltage lines, which offered lower interconnect costs than large transmission lines. "So if it's a question of working with a lower wind resource, you have to have lower overall costs, you need to have a higher Power Purchase Agreement, and generally it helps to have a standard that lays out that you are competing with power from within the state, and not necessarily from higher resources in other states. Arizona was definitely looking for projects within the state." The 6,000-acre Dry Lake project site is in the White Mountains area, which runs along the Arizona/New Mexico border. It is the second highest mountain range in the state, and the area is dotted with mountain lakes and streams. The first phase of Iberdrola Renewables' Dry Lake project employed 30 Suzlon S88 2.1 MW turbines, while phase two, which was completed earlier this year, has 31 of the same Suzlon turbines, for a combined nameplate capacity of 65 MW. The region where the wind power project is located is fairly flat but with some knolls and rolling hills, and there is a fair bit of vegetation. The area is lightly populated, at least by people. "There are a lot of cattle, though," says John Sherman, Dry Lake's plant manager. "It's a big cattle grazing area. It's wide open here—and it's been a particularly good year for wind here." As Gronner puts it, the wind power project was welcomed with open arms by Navajo County, where it is located. "We're a large investment, and we brought a nice tax base and jobs to the county. They were supportive of the project from day one." Ownership of the land for phase one is checkerboard, with every other section of land owned by a different party, either private, state, or BLM land. At the time of development of phase one, the Arizona State Land Department was focused on opening up high value land for residential development around the Phoenix area versus low value land, such as the location for the Dry Land wind project. "It took a bit of time to get the state's attention because we're talking about land that is leased for grazing, so it's not big revenue. But the state does have a policy of supporting renewable energy. "We brought them up to speed on the wind project, what we wanted to do, that the actual footprint of the project is small, and the revenue that could be generated, and they had a very favorable response." On the federal lands side, they went through the National Environmental Policy Act (NEPA) review process. "That ended up being the gating item on the schedule in getting phase one done from a permitting standpoint. But we were able to get through the NEPA process very quickly. We have a great BLM field office in Stafford, Arizona, that gave us a lot of support and attention." In fact, Gronner said, the Dry Land project was the first wind project built after the BLM came out with its programmatic Environmental Impact Statement. On the private land side, there was only one landowner, Rocking Chair Ranch, headed by Bill Elkins. It was actually Elkins who started work towards getting a wind farm. He purchased several met towers to prove there was sufficient wind. "Bill had a vision for a wind project for this land from day one," says Gronner. Gronner said that the planning for the project was a bit more complex due to the multiple ownership of the land, private and public. "Our preference would have been to keep it all on private land because that would have been the most expedited way to do the project. But because of the nature of the land holdings in the area, we knew we would need to involve at least the state, and also the BLM, because we needed a fair bit of land. "With it being a lower wind resource, we really needed to spread out the project, so the turbine spacing is greater than we would normally do with our wind projects. We wanted to minimize the amount of interference, turbine to turbine, so we opened up the array and that involves a larger area. If we had a more robust wind resource, we might have been able to pack in the turbines tighter." The turbines at Dry Lake are from 1,000 to 1,400 feet apart, which is anywhere from 1.5 to 2 times the spacing that Iberdrola would normally do. In terms of construction, Gronner said the project was fairly straightforward. "It was a very constructable, logistically unchallenged site," he said. There was a good transportation link, with the site being just off I-40. There is also a local rail link and a good supply of construction commodities and material they needed. "Going in to the project, our construction guys were very pleased with the constructabililty aspect and the availability of resources to get the project built," says Gronner. The site is about 200 miles east of Phoenix, and the nearest major center, Snowflake, is only about seven miles away. Phase two already had an access road built by utility APS that went into an APS substation. "They had built the substation a year before, and it's a 30 to 40 foot wide road coming in off the main highway. We were able to get an easement to utilize that, and it provided good, strong access to our phase two area." Phase one also had a good access road—they were able to use a road that had been put in to service a hog farm. There is a single lane access road between the two sites. There were no major construction challenges, nor did they expect any, says Gronner. Everything had to run smoothly with this project, with a very tight and workable budget a must, due to the low wind resource of the project. They carried over employing Suzlon turbines into phase two, for operational efficiencies. "It makes sense to have the same turbines," says Gronner. "We've been happy with them." "They've been reliable, we get a very high availability with the Suzlon turbines," says plant manager, John Sherman. They deal with a warm, dry climate in this area of Arizona, which does not pose any challenges from an operations and maintenance perspective, says Sherman. "It's pretty much business as usual. In the summer of 2010, we hit 101 degrees, but usually temperatures in the summer are in the upper 80s or low 90s. But it's very dry." It's been a very dry year in Arizona, period. The state had its largest forest fire, ever, this past summer. The Wallow Fire, fueled by extremely dry conditions and helped by strong winds, had burned an estimated 538,000 acres of forest in the White Mountains of eastern Arizona by June. The closest it got to the Dry Lake site was 70 miles away. "Generally, we don't have any huge problems maintaining turbines due to weather," says Sherman. "We did get a lot of severe lightning last year, and that's a hazard around turbines. But the lightning arrestor system worked well and protected all the components." While Iberdrola planned for Dry Lake to be multi-phase, there was really no carry over from one phase to the other. "The phasing concept is different for different situations, but our approach on Dry Lake was to have two different phases, east and west, because there were two different transmission lines that we were connecting to," says Gronner. "We ended up doing the west phase first because that involved land from the Rocking Chair Ranch where they had been collecting wind data for some time. We also negotiated and executed the Power Purchase Agreement based on phase one first, because that was the business appetite of our customer at the time." Though there was a time gap of about 18 months between the two phases, they ended up using many of the construction contractors from phase one, for phase two. Blattner Energy was the major civil contractor on both phases. Dry Lake, with its low wind resources, could be a business model for the wind industry in the future. In much of the U.S., the industry has already developed the easy, wind-rich sites, the so-called "low hanging fruit". "Dry Lake is a little bit of a different animal, wind project-wise," says Gronner. "I don't think Dry Lake necessarily would normally jump out as a place to have a two-phase wind project. It is a little bit out of the norm, but it was a good match in terms of timing, general market conditions, and supply and demand." Gronner agrees that many of the best wind sites in the U.S. have already been developed. "Increasingly, you are going to find that you have two types of wind project sites: lower wind areas that are closer to the end users, and then the farther away, more robust wind areas that are going to require some amount of transmission to get the power to where it needs to be, the major centers." Iberdrola Renewables is interested in developing all types of projects. The company has wind projects from the Pacific Northwest to California, the Midwest, and the eastern U.S.
"We're looking at projects in parts of the country that aren't necessarily in traditionally windy places—and I think that speaks to the company's and its employees' ability to tackle different challenges. Part of that, too, is how the wind turbine technology has improved. "It's a mix of experience and the ability to search for different opportunities, but it's also a better ability to predict the wind and better wind turbines. As the equipment and technology continue to evolve, future wind sites will also continue to evolve," concluded Gronner.